Such were the words of rocking sisters Ann and Nancy Wilson. What’s it got to do with a GI Joe vehicle? Nothing other than the title, plus I love the intro riff to that song. There’s no way to effectively communicate via prose a chunky palm muted power chord followed by a ringing harmonic, so I thought some lyrics would satisfy my need for a lame reference. You’re welcome. We don’t feature vehicles here nearly as much as we should, considering that the 80s and 90s Joe line was as much about the rides as the guys. Sometimes it’s difficult to get the larger examples into a space large enough for a decent photo shoot. Some are better suited to outdoor or dio shots, and I just don’t have the time to get those kind of setups accomplished. For the Barracuda, I suppose I could have thrown it in the kids’ pool or even the bathtub, as I’m sure that’s where it spent a lot of time back in the day. The features of the toy are centered around real aquatic adventures. The main draw is a real diving action that is basically the same baking soda powered action that has been around since the old diving figures and subs of the 1950s, now made possible via a tablet. The same feature was also a part of the Toxo Lab set. Spring loaded torpedos are also built in, although the firing mechanism is in the top of the ship. Extra missiles store in the usual torpedo locations on the hull. Speaking of the hull, the Barracuda had a reverse color scheme variation, with the blue and black switched. Other 90s vehicles like the Scorpion also had the same kind of variation. Overall, the Barracuda isn’t all that interesting beyond its features, and only accommodates a single figure. Considering the colors, I find it actually matches up well with the Cobra Eels rather than the Joes. The only thing worse than this was when Hasbro repainted it 2000 and forced you to buy it to get the solidly done Lamprey figure. If it hadn’t been the first Joe toy I found at retail in 2000, I would have never owned this mold at all. My brother and I each got one of these for xmas in 1992. We swapped the parts so I got a black ‘stealth’ sub and he got a blue one. Both of them spent a lot of time, being dipped into dams. In one episode of Dic’s GI JOE, these subs were enormous, so much that little jet ski thing emerge from the holes on the top of the bow. 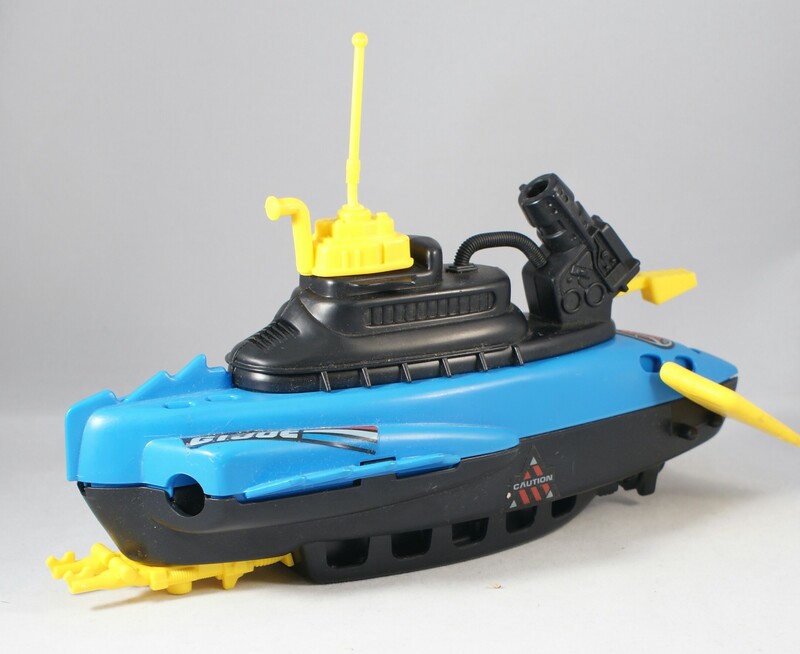 Submarines were underrepresented in the popular toylines of the day. 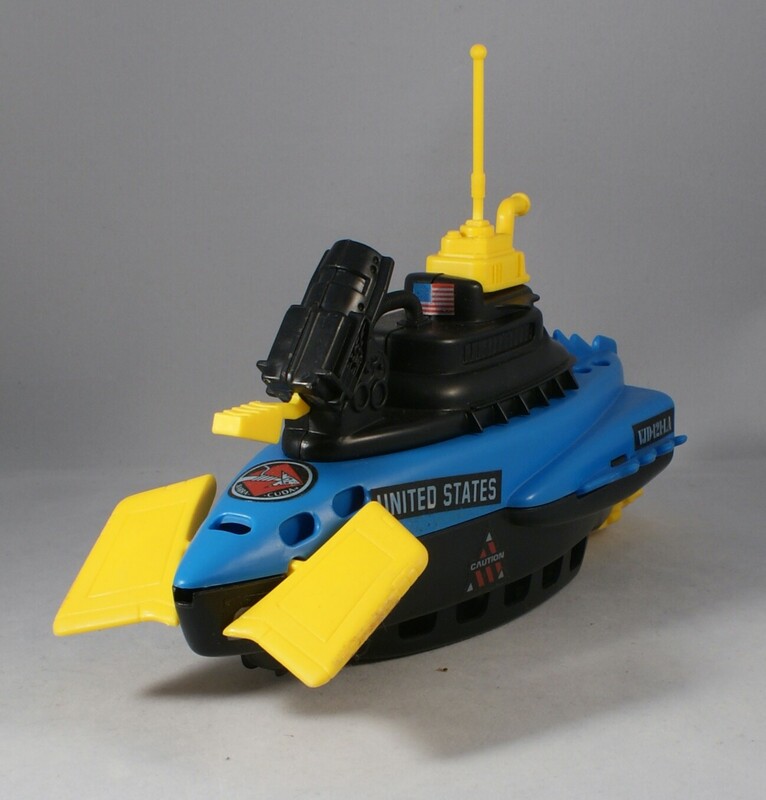 GI Joe didn’t have many subs, Transformers had no outright subs (a few yoga-pose pretzel Pretender figures turned into submersible craft though). That gives the Barracuda some distinctiveness in the line. It came out at the time of a surge of divers (Wet-Suit, Deep Six, Eel). It was a nice vehicle to have given those figures in 1992. Obviously it’s not anywhere near as good as the 1980s vehicles but by 1990s standards for the line, it was decent. I hope to not see it in Modern era. I always skipped over this one at the store, because honestly, it never looked fun to me. When I look at it, it reeks of how crap the quality became, gone were the days of well – conceived, brilliantly sculpted, durable vehicles dancing between fantasy and reality in the brand, then theres the loss of detailing, the crap plastics and the god – awful colours used….the death knell of the brand was at hand and the sheer magnitude of boys toys of the era holding sway over little boys and girls was at its nadir….